Music infringement cases usually have obvious links between the parties in terms of musical style and influence. In the case of New Order and John Denver the two parties are musical polar opposites. New Order emerged from the ashes of Joy Division in Manchester in the early 1980s and very much embraced the anti-establishment punk ethos. Their music crossed the divide between post-punk guitar and electronic dance, and they are credited as being one of the most pioneering and influential bands of the 1980s. John Denver was a globally successful American singer-songwriter, writing largely in the acoustic folk and country style. Leaving On A Jet Plane was written and recorded in 1966 and released on the album John Denver Sings, originally titled Babe, I Hate To Go. American folk trio Peter, Paul and Mary recorded a version of the song in 1967 for their album 1700, and it was released as a single in 1969, reaching number 1 in the US and number 2 in the UK. The similarity between the songs is focused on the verse of Jet Plane and the guitar solo of Run. Both are eight bars in duration. The songs are in different keys; Run is in C major and Leaving On A Jet Plane in G major. However, the melodies in question follow a similar shape over a chord sequence that is identical for the first six of its eight bars. The most striking coincidence between the two comes on the first beat of the first and third bars of the eight-bar sequence, where the fourth note of the chord is added (a musical device known as an appogiatura. This quickly resolves downwards to the third note of the chord and then further down to the tonic note. In Jet Plane this occurs on the words "dawn is breaking" and "taxi's waiting". In Run the parallel notes are the 4th, 5th and 6th of the solo. Another area of coincidence is in bars six, seven and eight of the example. In Jet Plane, on the words "already I'm so lonesome I could die". Here nine consecutive notes are identical in pitch, and similar (though not identical) in rhythm. In terms of access to the original song, New Order's guitarist Bernard Sumner was aged 13 in 1969 at the time Leaving On A Jet Plane reached number 2 in the UK charts. The style of the two songs and of the oeuvres of the two artists is entirely different. This fact in itself lessens the likelihood of plagiarism having taken place, either consciously or sub-consciously. The chord progression that both songs employ in the verse is a standard one, using the chords I IV I IV I IV V V. New Order substitute the penultimate V chord for a chord of ii (the minor chord of the second key of the scale). The appogiatura device used in the melody of both is commonplace in western classical and popular music. John Denver's first album in 1966 contained cover versions of four Beatles songs, all of which make plentiful use of the device: Here There And Everywhere uses the appogiatura on the phrase "hoping I'm always there", every line of the verse of Yesterday uses the device, including the very first word "yesterday". It can be heard in And I Love Her on the verse "bright are the stars that shine, dark is the sky" and on In My Life at "but of all these friends and lovers", and "never lose affection". Many New Order songs are build around the revolving chord progression I IV I IV, their first two singles Ceremony and Temptation, and the Movement album track Dreams Never End being good examples. Typically guitarist Bernard Sumner would improvise a guitar solo based around the song's sung melody line. The guitar solo in Run does just that, embellishing the first eight bars of the song's melody. 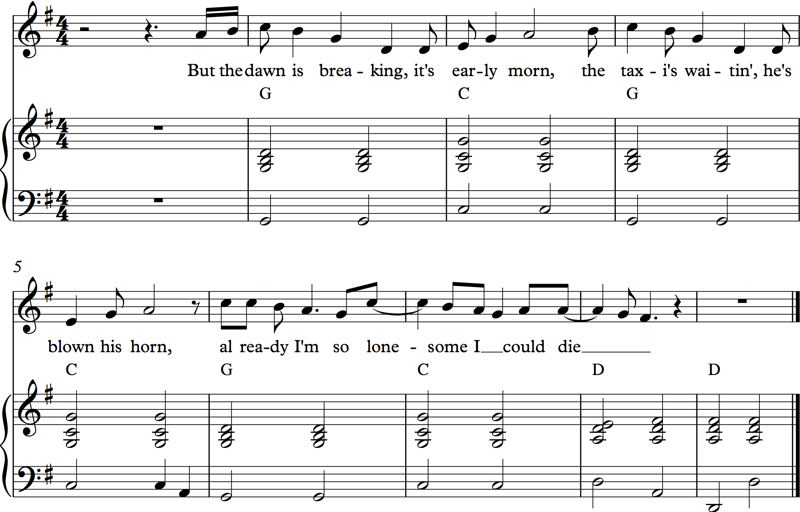 The Score & Audio tab illustrates the original sung melody on which the guitar solo was based, and it is hard to distinguish any real similarity between this and Jet Plane. The sung melody would have been written first, and does not infringe. The guitar solo, as an arrangement of the sung melody, should also therefore by extension not infringe. 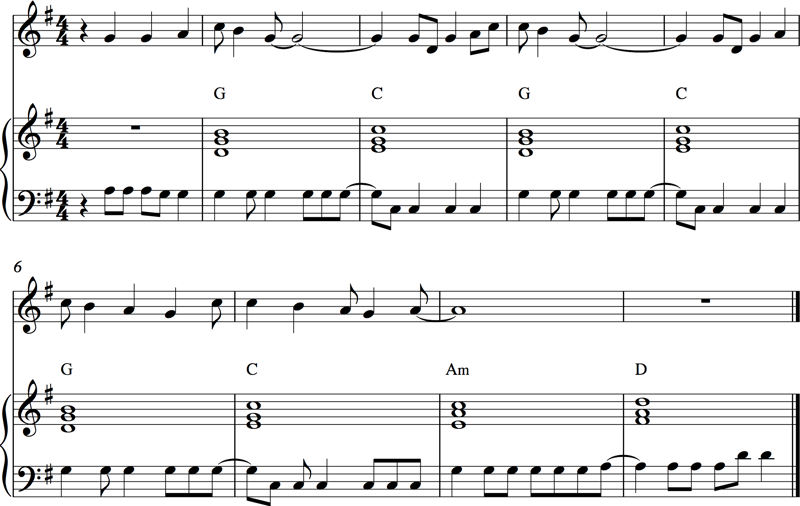 The nine consecutive identical notes in bars 6-8 of each example are simply a repeated descending major scale with an upward turn at the end (C, B, A, G, C, B, A, G, A), and are musical commonplace. New Order were true innovators. From their early Joy Division days through their five studio albums of the 1980s they consistently broke new ground, both in terms of musical style and use of studio technology. There was simply no need for them to plagiarise. (Denver) © Cherry Hill Music/Harmony Music Ltd. Recording by John Denver ℗ 1969, RCA Records. (Gilbert/Sumner/Hook/Morris) © Universal Music Publishing Limited. Recording by New Order ℗ 1989, Factory Records. Score transposed here from the original C major for ease of comparison. Entertainment Weekly reported in 1991 that the case had been settled, with a writer share to John Denver and admission by New Order's publishers of "inadvertent copying". "Rob [Gretton, New Order's manager] fought this so hard. He hired a musicologist in England to analyse the song. It turns out that musicologists use a scale of twelve notes and if eight of those notes are present in both songs, then the accused, us, is deemed guilty. Which we were. Rob wouldn't have it, so he then got an American musicologist to analyse it. He said the same. We lost again. John Denver got his per cent cut and a writer's credit . . . I still don't hear it now. Imagine if we did that with all the tunes that sound like us? We'd make a fortune." Weighing up all the evidence it is surprising that the musicologists recommended a settlement to New Order's management. That there are many coincidences of notes is not disputed, but a strong defence of musical commonplace can be made here, added to the evidence showing conflicting styles of music, and the improvisatory nature of the solo based on the sung melody of the verse which clearly does not infringe. Entertainment Weekly 1991 article on the settlement. Google Groups forum from 1996 quoting New Order's drummer Stephen Morris as saying the settlement was $20,000.